The next Poker Copilot will have some improvements for Merge Network rooms such as Lock Poker, Carbon Poker, and RPM Poker. The first important improvement is letting you tell Poker Copilot what your “preferred seat” setting is in Merge. Ideally Poker Copilot would auto-determine this. But Merge Network stores the info in a file whose format I’ve been unable to reverse-engineer. I solved this one by hard-coding a list of Merge Network table names in Poker Copilot, each with a pre-defined size. So, for example, if you play on any of the “Santiago” tables, Poker Copilot knows this is a 6-player table. 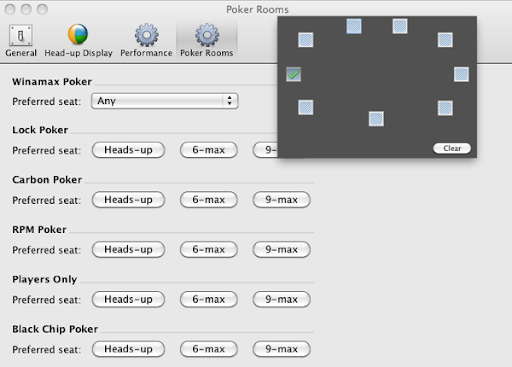 Again, not an ideal solution, because when Merge introduces new tables, I’ll need to update Poker Copilot. But until Merge add this information to hand history files it is the best solution I’ve thought of. There are limits to this approach; so far it only works for real money ring games. Play money and tournaments will need other solutions.